Learn a new, creative way to use paper to make art! Chinese style paper reliefs are three-dimensional images marked by interesting texture and appealing beauty. 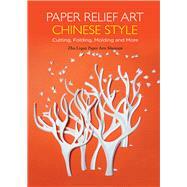 From small works for display on a table or desk, to interior decoration or even large works for public spaces, the range of the paper relief art form is demonstrated in this book. Divided into elementary, intermediate and advanced sections, the book starts with the simplest techniques, which can be mastered readily, bringing your imagination and creativity to light. The intermediate course guides readers to change and restructure basic techniques, enabling proficiency through the process of completing works. The advanced course focuses on works that appear sophisticated and complex while still evolving from simple elementary techniques. Paper was invented in China and it has played an important role in art making for many centuries. The continued development of papermaking and the art of paper has allowed for modern expression and creativity within traditional Chinese culture. Spirited lines and elegant colors, as well as free and natural forms, fully express Chinese aesthetics and evoke atmosphere. To create a work of art, proficient techniques are a must. However, as an ancient Chinese saying notes, "Techniques are not fixed." It is not enough to just rely on technical skill; the creativity of the artist is the key to success. So your active imagination, together with the step-by-step instructions in this book, are all you need to turn a piece of paper into a fabulous art work!